During the months leading up to HIMSS, I feel like a CPA anticipating April 15. It is a huge push to get an unbelievable amount of work done in not nearly enough time. After all, I’m the one and only HIStalk team member other than the folks whose time is fully committed to writing what you read every day. As in previous years, I enlisted the help of a couple of my family members to help me get things to the convention center and distribute the HIStalk sponsor signs. Our booth is small and there is little to it, so it takes about 15 minutes to set up. It usually takes a couple of hours to deliver all of the sponsor signs since we do it before the exhibit hall setup is complete. It’s hard to find the booths with just their numbers because of irregular aisles. This year, we waited until the opening day when all of the booth signs and numbers were up. We got it done in record time. 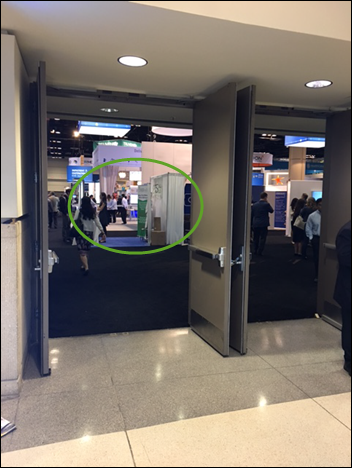 Midway through HIMSS16 a year ago, I went to my first booth selection appointment. With the help of someone there, I chose our booth location purely because it was at the top of an escalator and not in the back of the exhibit hall near the loading docks or restrooms like we usually get for our tiny 10×10 space. On Sunday afternoon when I arrived to set the booth up, our booth was the first thing I saw. Even that first look at our pretty decent-looking spot could not prepare me for the opening of the doors to attendees at 10:00 Monday morning. People were lined up as far back as I could see. The location of the booth made up for all of the prior years combined. Our booth was busy from the time the exhibit hall opened until it closed each day. I love HIStalk, I read it every day. Please tell Mr. H not to ever stop writing HIStalk. HIStalk is required reading where I work. Does that really look like Mr. H? (asked while pointing at our cardboard standee of the smokin’ doc). Do you know who Mr. H is? Why are so many people visiting your booth? What do you guys do? 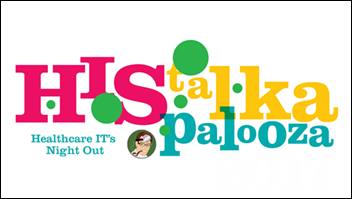 Do you have any extra tickets to HIStalkapalooza? 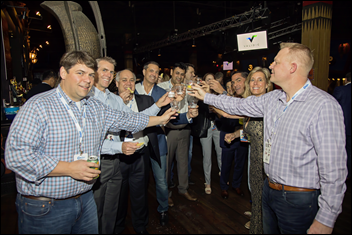 I heard a rumor that this was the last year for HIStalkapalooza. Please tell me it isn’t so! I am always excited to meet the guests who spend time in our booth. 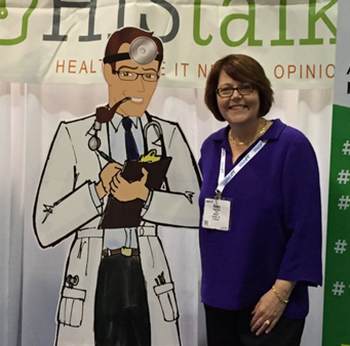 This year I had a chance to talk with Nancy Ham, named as one of the most powerful women in health IT. She spoke about the importance of mentoring young women in the workforce. 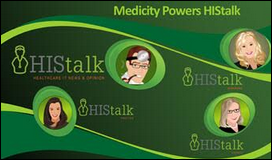 Keep an eye out for an upcoming HIStalk-sponsored webinar where she will cover a similar topic. 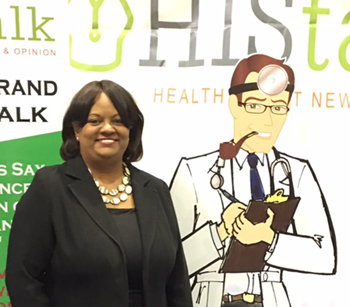 It was interesting to talk with Dr. Regina Benjamin, the 18th Surgeon General of the United States. 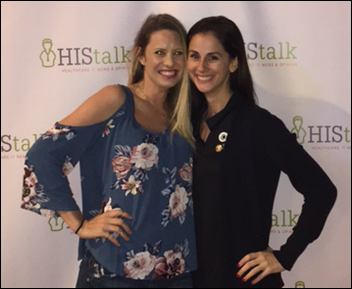 She was at HIMSS with accessURhealth to emphasize the need for tools and resources to positively impact the identification, treatment, and awareness of mental and behavioral health. 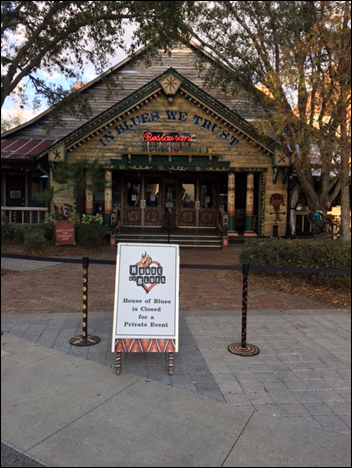 I packed up and left the booth early on Monday so I could be a the House of Blues by 4:30 to walk through the logistics of HIStalkapalooza. 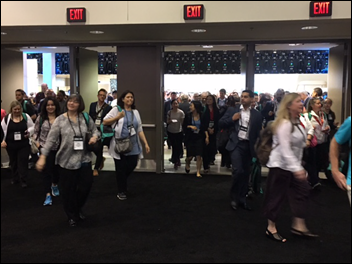 It was like HIMSS all over again – we were two hours from opening the door to the attendees and there was so much left to be done. None of the sponsor banners were hung and the step-and-repeat red carpet backdrop I had bought online for $250 was delivered to my feet in two big boxes. I showed the people who would hang the banners where they should go. I know Mr. H mentioned this, but you had to be there to appreciate the ingenuity and determination Jenny and Val from Optimum Healthcare IT demonstrated. I asked the House of Blues if they could provide someone to help us assemble the frame that holds the step-and-repeat. After spending about 30 minutes on it, one of their production crew told me we were probably missing a part and it couldn’t be put together, leaving us without a backdrop and Mr. H with a wasted investment. I sighed with frustration and went on to the next urgent matter. When I returned, Jenny and Val were sitting on the red carpet with the pieces of the frame spread out, trying to figure out how to assemble it. A few minutes later, they had it standing, albeit a little bit propped up. There were a lot of challenges with the House of Blues this year, but as always, someone trying to do a good job provided a highlight. I ordered a toast for a group of people and the bartender said a manager would need to approve. She arrived after 15 minutes and said they aren’t allowed to provide shots at events like ours. After the manager was out of earshot, the bartender decided that as long as he placed an ice cube in each glass, it’s not technically a shot. The tradition was upheld. The result was the now-famous Longo Lemonade toast. This is Jean, a HIMSS shuttle bus driver who also provided amazing service. I had waited 30 minutes for the shuttle to stop near where I was staying and it finally arrived just as it started to rain. As the last passenger stepped off of the bus and I took the first step to enter, Jean received a call from his dispatcher telling him to return to the garage empty since the shuttle schedule was changing from every 15 minutes to every 30 minutes. After a bit of coercion, Jean agreed to take our group of passengers to the convention center before returning to the garage as instructed. I got there on time and still dry. 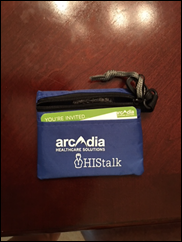 We gave out our usual HIMSS survival kits, thanks to Arcadia Healthcare Solutions. 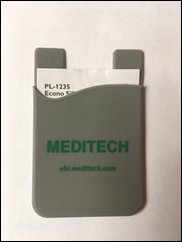 Meditech gave us a supply of “Mobile Pockets” and cool green pens to give away. I managed to grab a pocket for the back of my cell phone cover, but the pens were gone before I got one. I don’t see a lot of cool things at our booth because most companies are demonstrating in their own booths. The one exception was Blausen. 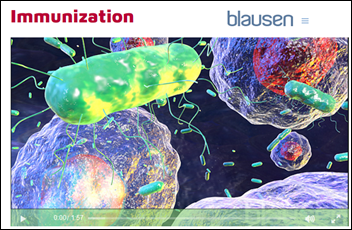 It is like a collaboration of WebMD and Pixar, They claim it is the world’s largest library of medical and scientific illustrations and 3D animations, but that was an understatement. Each one has a short video that describes the condition, symptoms, and treatment clearly with visuals that are hard to stop watching. The team from Spok stopped by for a picture and I admired their company-branded shoes. The Spok logo was subtle and the color matched the logo on their shirts perfectly. HIMSS17 was manageable for me because of the help I received from Brianne, shown here backstage at the House of Blues with some of the Party on the Moon dancers. She spent the weeks leading up to HIMSS making sure all of the HIStalkapalooza invitations were sent and all of the (never-ending) changes were kept straight. She answered questions from sponsors and kept them on track. During HIMSS, she spent time in the booth and gave people information. She spent almost all of her time at HIStalkapalooza at the door enforcing the rules for admission. Thank you, Brianne. 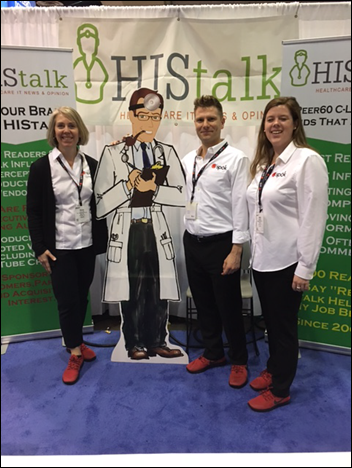 My favorite part of HIMSS every year is connecting with the readers and sponsors. I interact with people on the phone and through email all year, so it is really a treat to meet people I have only spoken to and get a hug from those I have known for years. I thought HIStalkapalooza was fantastic again this year. Thanks to the many sponsors that made it possible. Despite the fact that Mr. H swore he wouldn’t do it again because of the work involved and the financial risk he takes in hoping he can cover the cost with sponsorships, I am already hearing him softening up a bit. My plan is to find sponsors willing to sign up early to avoid our last-minute panic and reduce his risk. It makes sense to limit the number of sponsors to those who can commit early and thus make it extra special for them. Stay tuned!